Biological sciences form the basis of many new areas of science and technology. They are the foundation of our understanding of a diverse range of subjects – from evolution, genetics and diversity to medicine, drug and human development. On this course, you can choose to study human, medical or genetics and molecular biology. This course has been accredited by the Royal Society of Biology for 2019 entry. Kingston University graduates from this programme will receive one year's free membership of the Royal Society of Biology. 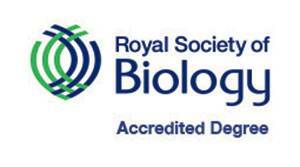 The Royal Society of Biology is the leading professional body for the biological sciences in the United Kingdom. The Society represents more than 16,000 biologists from all areas of the life sciences, as well as more than 100 organisations which make up the diverse landscape of biology in the UK and overseas. The Royal Society of Biology offers members unique opportunities to engage with the life sciences and share their passion for biology. demonstrate your support for the future of biology. Year 1 is common to all streams of this biological sciences degree - human biology, medical biology, and genetics and molecular biology - as well as a number of other degrees. It has been designed to give you a thorough understanding of the core subjects within life sciences and provides a measure of flexibility between courses. In Year 2, you will follow the modules within your chosen specialism (Human Biology, Medical Biology or Genetics and Molecular Biology). You will develop your knowledge, techniques and practical skills, as well as additional transferable and employability skills. A course specific core module will integrate subject-specific knowledge and develop your skills in preparation for your final-year research project. All students are encouraged to identify opportunities for work experience during the course, which may be through an optional sandwich year taken between Years 2 and 3. Alternate opportunities within the University may become available such as acting as a student ambassador. In Year 3, you will examine more advanced and applied aspects within your subject area. You will also undertake an independent project – this provides an opportunity to research a topic of your choice within your specialism as either a laboratory-based project or a library-based dissertation. This is a core module taken by students studying BSc Biomedical Science, Nutrition, Medical Biochemistry, Biochemistry, Biological Sciences, Pharmacology, and Forensic Biology. The module introduces students to fundamental physiological concepts which underpin the coordinated functioning of the human body, including homeostasis, cellular communication and movement of molecules through body compartments. The main physiological systems of the body are then covered, including the nervous, muscle, endocrine, respiratory, cardiovascular, renal and digestive systems. Core material is delivered through lectures, problem solving exercises and directed reading. Laboratory practicals provide experience of selected techniques, experimental design and data analysis used in physiological experimental work. This is a core module for students studying all routes of the Biological Sciences. It aims to develop the scientific, academic and research skills that were introduced at level 4, and to relate applications of these skills to study and research in evolutionary biology and how this is associated with all elements of biological sciences. Research methods and employability skills are taught within the context of biology, evolution, genetics and molecular biology and associated employment. You will be introduced to the fundamental concepts of evolution, the role of molecular biology to investigate natural populations and biodiversity, evolutionary genomics and genetics, molecular basis of speciation, phylogenetics and the application of molecular analytical techniques in the context of environmental and medical problems. These subjects are further examined in terms of the latest knowledge, techniques and research in modern evolutionary theory. You will gain a range of practical skills including molecular laboratory methods and bioinformatics. This is a core module in Sport Science, Exercise, Nutrition & Health and Biological Sciences (Human Biology) degree pathways, and offered as an option on the Sports Analysis & Coaching. This module covers the acute and chronic physiological changes induced by exercise and an understanding of cardio-respiratory health. This module will develop the students' application of exercise physiology to performance. The module will also enable students to apply the role of exercise and physical activity as a prescription therapy to clinical diseases. This module will further develop the student understanding by equipping them with the scientific skills to monitor and assess health, fitness and performance. Module information to be confirmed. This module aims to extend existing knowledge of the structure and function of microbiological agents in health and disease and the immunological responses raised as a consequence by the human body. Microbiological processes will be examined along with methods of controlling the organisms responsible in the laboratory environment as well as within a patient. The module also deals with the different cells and organs of the immune system and how these function and interact to protect the body from infection. An introduction to molecular processes and signalling events that are important in communication between cells of the human immune system are studied. This is a core module in the BSc Biomedical Science and BSc Biological Sciences fields. The module discusses cellular mechanisms of disease. In addition it considers the role of cellular pathology in the context of other pathology disciplines such as Clinical Pathology. Particular emphasis is given to laboratory aspects of cellular injury and their application in routine diagnosis. The module delivery is in the format of lectures, tutorials, poster presentation, practicals and demonstrations. Core factual material is provided via Canvas with keynote lectures used to explain concepts. Teaching and practical session are supported by online pathology material. This is a core module for Biomedical Science, Biological Sciences (Medical Biology), Medical Biochemistry, Nutrition and Pharmacology, and an option for Biological Sciences (Human Biology). It is a pre-requisite for the level 6 modules LS6003 (Chemotherapy of Infectious and Neoplastic Disease) and LS6006 (Clinical Immunology and Medical Microbiology). This module provides an opportunity to learn more about the structure and function of microbiological agents in health and disease and the immunological responses raised as a consequence by the human body. Through the lectures a number of microbiological processes will be examined along with methods of controlling the organisms responsible in the laboratory environment as well as within a patient. Students will also become familiar with the different cells and organs of the immune system and how these function and interact to protect the body from infection. The module also introduces some of the molecular processes and signalling events that are important in communication between cells of the human immune system. This module is a core module for Biological Sciences (Human Biology route), and an optional module for Pharmacology and Biological Sciences (Genetics and Molecular Biology route). This research-driven module will provide a thorough background in the fields of neurophysiology and neuropharmacology and introduce a range of current topics in neuroscience, selected from such areas as cellular and molecular neurobiology, sensory and motor systems, cognitive neuroscience and degenerative neuropathologies. You will experience current research techniques and learn to critically evaluate and discuss different ways of studying the brain. This module is a core module for students studying Biological Sciences (Medical Biology) and is an option for those studying Biological Sciences (Human Biology). The module is also an option for Forensic Biology and Medical Biochemistry. The module provides contemporary insight into human parasites of global importance, the diseases that they cause, and the role of vectors in transmission. Arthropod borne viruses (arboviruses) are also considered, particularly in the context of co-infection with human parasites. The epidemiology of parasitic disease, morbidity, mortality and socioeconomic impacts are discussed, with an emphasis on recent advances in control measures. The module is delivered through research-informed teaching; practical laboratory sessions form an essential compliment to lectures and tutorials, demonstrating methods of diagnosis of parasitic disease and identification of vectors.